4 X 4: 3 Birds A brief history of what I Believe to be the 1st piece for live musicians specifically written for the J. Pritzker Pavilion Sound System. So, around 6 years ago now (wow, that long ago?) I was invited to take part in a very singular collaboration. Lou Mallozzi at Experimental Sounds Studio asked me to be a part of a team including Shawn Decker and Olivia Block to create a sound installation for the J. Pritzker Pavilion based on the sound of trains for the Chicago Humanities Festival. The only stipulations were that we were to try and keep the sounds as recognizable as possible and we had to work with the man who built the system itself, Jonathan Laney, to create and tweak a setting for the Pavilion’s sound system that carried the sound through the space in 5.1 surround. Kind of like a glorified (extremely glorified I might add) home theater system. Each of us went to work creating short vignettes that Lou then deftly mixed and edited together into a 25 minute or so sound piece entitled Train Time. We installed it in the fall of 2008 where it ran during humanities festival for a good couple of weeks every day. Spectators wandering through the park were serenaded with the sounds of trains literally moving across the space, juxtaposed with a myriad of processed and un-processed train whistles, screeches, and ambient sounds of insects and animals responding to those screeches. In general, the idea was to make the spectator feel like they were in a world that sounded real, but was not quite so. Where sounds moved in impossible dimensions against one another so if one closed their eyes, they would not necessarily know where the sounds came from or how they got there, but only that they were in a somewhat un-real sonic space filled with real sound. To achieve this, we worked very closely with Jonathan to strike a balance between the movement in the space reading and the sounds being equally distributed so that every seat in the house sounded nearly the same. For those who know a bit about psycho-acoustics and the way sound travels through space in general, this is no easy task. But thanks to the masterful design concept and attention to our artistic intent, we were able to get it to sound perfect, no matter where one sat. This experience kind of opened up many questions for me and made me think hard about how I conceived of my live sound practices. In a situation such as the one at the Pritzker, where all the sonic energy is coming from the speakers, it is really possible to localize sound in interesting ways, even with musicians on stage? To create a sense of un-reality as convincing as the sense of ultra-reality created by the configuration for the Grant Park Symphony (though I would argue that feeling you are in a concert hall while sitting outside in downtown Chicago is also a sublimely un-real experience)? So I started to conceive of other things that could possibly be achieved in that space, all the while keeping in close contact with the ever approachable Jonathan Laney. 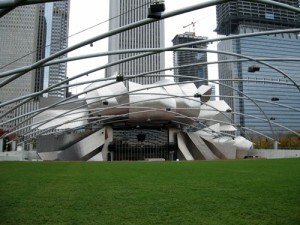 The result was the Steve Reich 75 birthday celebration in Millennium Park. In many ways, Reich Fest was the ideal situation in which to experiment. The people involved in maintaining the Pavilion, are some of the best in the city, and besides that, are still extremely passionate about what they do despite year after year of being beset from all sides by crazy amounts of city wide festivals and private events creating long days during the summer that would easily burn out most crews. They look at my sometimes 50 + input riders, with limited soundcheck time, and without blinking an eye just kind of say, “lets do this”. Jonathan Laney has always figured out how to keep the system up and running despite budget difficulties and has remained open, receptive, and thoughtful in how to implement ideas within the bounds of what is currently possible. Without his presence and expertise, as well as willingness to offer his time to it, nothing like Reich Fest would have been possible. And I can’t forget to mention again, the amazing energy and trust of the two people who really made the whole thing happen, Cultural Affairs classical music programmer Lacey Capps, and eighth blackbirds absolute juggernaut of a managing director Jen Richards. Neither of these two were afraid to put their positions, reputations, and personal lives on the line and both had an extreme amount of trust in what was happening even though we were swimming in un-tested waters. Trust was what was needed, and it is what made the evening of August 26th 2011 so magical for everyone there. I wrote more about this show here. Since that night, I have worked in the space with 3rd Coast Percussion, ICE, and Glenn Kotche in addition to doing 2 more shows with eight blackbird over the course of the 2013-13 seasons. Each year, we have explored different aspects of sound in space as well as different ways of approaching the programs. An all Varese concert, a concert that mixes electronic and acoustic works putting the audience in the middle of the band, putting different frequency ranges of the various instruments on stage into different parts of the space. But it occurred to me that so far, nobody has written music specifically for this system since 2008 when we first did Train Time. Strange, because it is such a completely singular sonic situation that one would have imagined it would have been explored for its creative potential, perhaps through a series of commissions or at least a call for works. And though Train Time was an achievement I am very proud to have been a part of, the interactive composer in me wanted to try and do more. After many years getting to know and understand how sound behaves in the space, I was finally presented with the opportunity to do so in the form of a piece I have been working on for Spektral Quartet entitled 4 X 4: 3 Birds. 4 X 4 is actually going to be a series of works for Quartets of different combinations, the first of which was written for 3rd Coast Percussion (though it was originally entitled Improvisation in an Altered State). The idea is that the quartet plays with amplification and their sound is transformed by simple space/time transmutation in some kind of 4 channel space (so a sound system with 4 speakers each driven by an independent source). Each player occupies a different space and has a slightly different relationship with time, so that the sounds they play are not only heard from different sectors of the space, but a pattern of delays, each unique to individual performers is heard within those sectors of space in different time relationships so the character of the generated sound from the stage changes over time. It is kind of like reading a quantum physics book but instead of formulas describing what is happening, sound is demonstrating it, if that makes more sense. In more human terms, I have been working with delayed sound as a performer for many years now (perhaps since I was a kid really), not just using electronics, but also just singing and making noise in highly reverberant spaces like big cathedrals and large open outdoor spaces. I am pretty obsessed with the idea that through sound, you can have a relationship with a continuum of your past experience and that that experience informs your future. In an exaggerated way, working with this relationship almost seems to predict your future when you improvise with it in that your next move is always the derivative (there I go with math talk again) of what has come before. It has to either fit or sharply contrast. Of course, everyone’s reaction to this will be different, but within one’s own experience, it begins to seem like music pours out of you in an inevitable way. This can apply to improvisation, but I also feel it can inform the phrasing and timing of notated music. When I listen to different versions of a Bach organ fantasy or perhaps a Brahms Intermezzo, I hear very different relationships with time being explored. In the case of Bach, specific timings in the form of tempo markings that we use today were not necessarily given and the micro-management of phrasing we have become accustomed to in 20th century music was not necessary because there were certain stylistic conventions of the time that would have informed the phrasing. With the advent of pre-recorded electronic music, and especially that which required performers to play along with a tape, precise and pre-meditated phrasing has become the norm and the freedom to interpret the music has been severely limited. Not that it hasn’t produced some fantastic music, but sometimes I feel like it has no natural breath. It is a snapshot of time and space that takes the performer out of the context of the current situation – a space/time that is fluid and malleable. (see a bit more on this here). So, the 4 X 4 concept is one that I hope humanizes the technological experience. Allowing the players to develop their own relationship with the space/time present in the room and hopefully putting them in the same space as the audience so everyone present go on a journey together. Though for this one, I have written out a score, each player is free to play their parts with a certain amount of freedom as the harmonic material has some flexibility to it. They are encouraged to listen to how the space responds to their playing and make phrasing and timing decisions based on that intuition rather than exact timings. The melodies are derived from transcriptions of slowed down bird songs. These songs migrate from player to player in the quartet and therefor, migrate around the Pavilion as the piece unfolds. But I am not going to do a harmonic analysis. I just wanted to give some context to what you will be hearing that Thursday night May 26th at 6:30. I am really happy that this piece will be premiered along-side another of Steve Reich’s masterpieces, Different Trains, as well as a new arrangement by my colleague and dear friend Katie Young. I am also happy that this will mark the debut to the Pritzker mixing console of Francisco Castillo Trigueros who will be working with the quartet on a spec(k)trally spatialized mix of the Reich. Hopefully many things that can be done with the space sonically will be revealed. I truly hope you can make it out and while you are there, remember to look up. And despite the giant screen with all the disembodied figures displayed upon it, DO pay attention to that man behind the curtain! In a related story, I will also be joining my friends in eighth blackbird for a show on the 19th of June. Program including works by Bryce Desner and Michael Ward-Bergman who will also be on the stage with the group. Previous PostDoes a Recording Steal The Musician’s Soul? Reflections on 4 years of touring Steve Reich’s Double Sextet with eighth blackbird.Next Post3 Singers? Try 3 Composers. (Or more!) A reflection on 2 years of collaborative work on the 3 Singer Opera.